The public auction of sand mining rights in the district here today saw serious allegations of making a blatant display of ‘loyalty’ to their political masters being levelled against senior officials of the Industry Department. Hosiery manufacturers have pinned all their hopes on the Prime Minister, Mr Atal Behari Vajpayee, for the withdrawal of the Central excise duty on hosiery and textile goods. At least, they hope they may be granted some level of exemption. An NRI couple was found murdered at a house on the Samrala road last night. The couple had come to India a year ago from the USA. According to the police, the couple was murdered due to a family dispute over property. Meanwhile, the son of the couple said on the telephone from Canada that his uncles were responsible for the crime, which might have been committed by some hired persons engaged by the former. 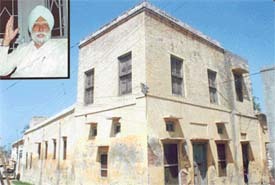 Mr Isher Singh Sandhu, a Canada-based NRI, has donated his double-storeyed ancestral house to the Manuke village panchayat to be converted into an old-age home, according to the sarpanch of the village, Mr Gurmukh Singh Sandhu. Thirty students of BCA (II) of Arya College here are in a quandary as they were not able to complete their 'numerical and statistical method examination' held yesterday due to the confusion over the use of calculators. 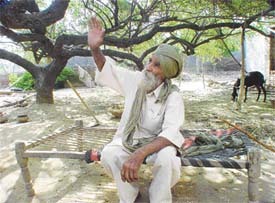 The MiG crashes at Mullanpur Dakha and Ambala have opened up old wounds of 85-year-old Santokh Singh, a local farmer, who lost his two sons and a nephew during an accidental bombing by an Indian Air Force plane 39 years ago. He received a meagre compensation of Rs 9, 000. The Indian Workers Association of Great Britain, a co-sponsor of the Anti-War Coalition, Great Britain, has urged Mr Kofi Annan, Secretary-General, UNO, to register a case against Prime Minister Tony Blair and President Bush in the court of International Justice and to withdraw the veto power of both countries, for bringing the UNO charter into disrepute internationally. He is short, bald, ornery and downright ugly by anyone’s standards, still he has become the most talked-about cartoon character among school-going children. Allegations of bogus voting were levelled against Congress candidate Sanjay Ghai in Ward No 2 by SAD candidate Iqbal Singh. He alleged that police officials, civil and election officials helped the Congress candidate as he happened to be a nephew of a senior police officer. 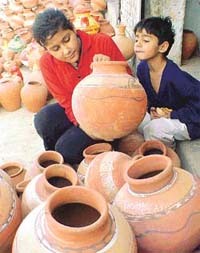 Ludhiana is the biggest city of Punjab. The government is ever challenged for providing more facilities to the city people for their convenience. So it becomes the duty of Municipal Corporation to look after the needs of the public and also to take proper care of several public facilities like water supply, sewerage system, road lights, parks, roads etc but with the passage of time Municipal Corporation officials seem to be bothering less about public good. A workshop on medical teaching methodology was held at the CMC under the aegis of Medical Education Cell of the institution here yesterday. Delegates from medical colleges across the state participated in it. The workshop was inaugurated by Dr J.S. Gujral, Vice-Chancellor of the Baba Farid University of Health Sciences, Faridkot. The District Consumer Disputes Redressal Forum has directed the Ludhiana Improvement Trust to execute a sale agreement, in a month, in favour of an aggrieved consumer and to hand over the possession of the plot allotted to her. 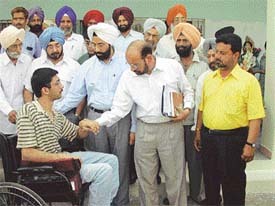 A special camp to identify handicapped persons for providing them artificial limbs free of cost was organised by the Punjab State Branch of the Indian Red Cross Society in collaboration with the Health Department at Guru Nanak Charitable Trust, Mullanpur Mandi, 20 km from here, today. A physical challenge: Dr D. P. S. Sandhu, Director, Health Services, Punjab, and Capt Jaiya, Secretary, state unit of the Indian Red Cross Society, present a tricycle and hearing aids to a physically challenged person at a camp at Mullanpur on Wednesday. With over 40 Ayurvedic dispensaries in the district, people of the area should presumably be in perfect health, but things are otherwise in reality as there is hardly any dispensary with a physician, who comes to work as per the prescribed timings. The Additional Director General of Police (Prisons), Mr R.S. Chalia, has recommended the suspension of two Jail Superintendents for their alleged involvement in a scandal involving the purchase of drugs and other items for jails. The two superintendents, who are reportedly absconding, were posted in the Ludhiana and Jalandhar Central Jails.